Apparently what stuck out for me in this week's Gospel stuck out for a lot of people. Every reflection I read was about this verse: Why are you troubled? 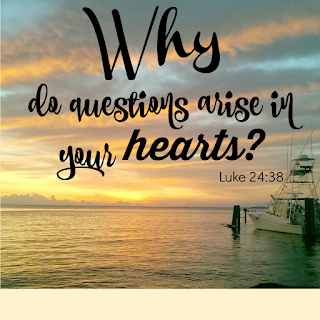 And why do questions arise in your hearts? (Luke 24:38) Excellent questions, Lord. I can see how the disciples who were there with Jesus were troubled and had questions. They were there. If this had happened in our lifetime, wouldn't we have questions and concerns? How can this be? Is it really a trick, or is He really alive and in front of us? Sometimes I think it's easier for me to believe now than it would be if I had been there and seen it with my own eyes. It's in the Bible, so we all know it has to be true. Can you even imagine what it would have been like, to have Jesus right in front of you with the holes in His hands, feet, and side? To be one of those women who stuck with Him the whole way? To be one who went to the tomb only to find it empty? To see with your own eyes that He lives? I returned home from an incredible experience over the past few days. My diocese had our CCW Convention. I was blessed to spend some days with around 250 fellow Catholic Sisters in Christ, to meet new women and reconnect with others. We had amazing speakers who just walked into my life for the very first time. I knew nothing about any of them, but now feel such a oneness with them. Our keynote speaker on Thursday evening following Mass and dinner was Kitty Cleveland. She has a voice of an angel and finally followed God's calling to be a Music Missionary. As I listened to one of her CDs on the way home, she told her story. She mentioned that she has, on occasion, received the gift of speaking in tongues. I've never seen this happen to anyone, so I am a bit skeptical when I hear people talking about this. A doubting Thomas, for sure, but Kitty gives some pretty convincing testimony about this. I told my husband about it, and he asked me how I could believe other miracles that happen every day and have doubts about this? Hmmm... He comes up with great thought-provoking questions every now and then, for sure! Why is it so hard for us to believe? 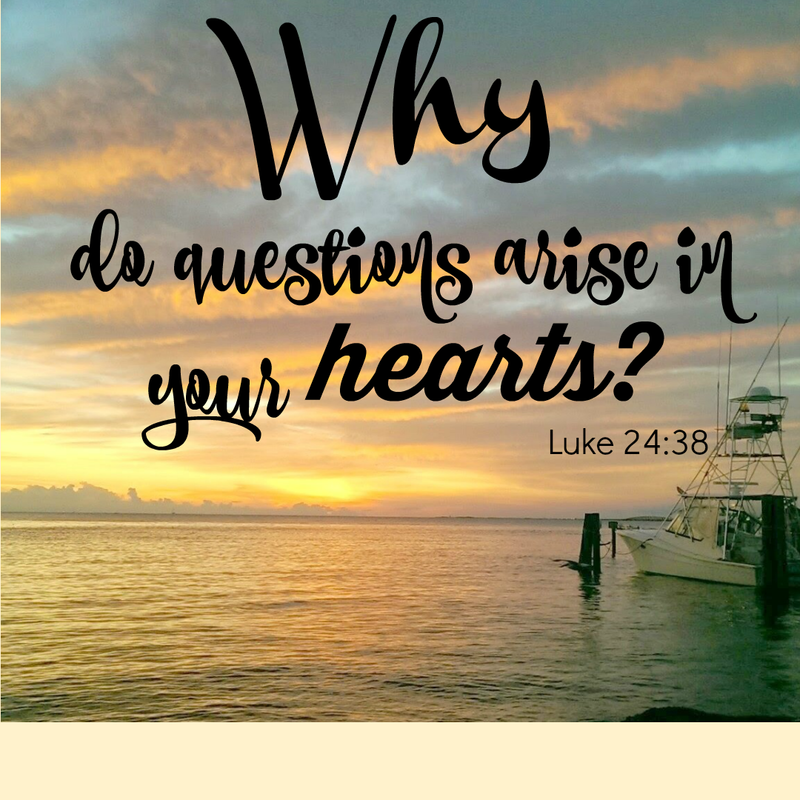 Why do questions "arise in our hearts"? The short answer: we're human. There are times when we lack faith. There are times when the evil one whispers those doubts and we hear them. Then we ponder on them. I mentioned to my parish priest once about ugly doubts that were entering my mind. He assured me that meant that I'm getting closer to God and making the devil mad. The devil does what he can to keep us from gaining our happiness, from reaching our goal: to get to heaven. It's in those moments when we need to picture Jesus on the cross and say, "I trust in you." I'm sure nothing makes the evil one sulk more than to watch someone do that. And I'm all about making him miserable! The solution: Give it to the Lord. As I said before, we're human. We worry, we have doubts. Some days are easier to give everything over to Him than others. There are tears, there are quick trips to the bathroom because of worry and that lack of control over others. And keep saying over and over: "Jesus, I trust in You". Great thoughts, Mary. I always enjoy your prospective!! Here is a great article on charisms. I have I mentioned mine? I have the "gift of tears!"